What is Blockchain & Cryptocurrency? Blockchain is essentially a distributed ledger system. But what does this mean? I’m sure you can find many other blockchain definitions on the internet, so I will try to describe what blockchain is, using my own way. Let’s say you are buying a cup of coffee at a café. When you pay, you tap/swipe your debit/credit card to the merchant’s machine. Here occurred some money/currency transfer from your account to the merchant’s account. But how do you know this has happened? And how can the merchant be sure that they are getting their money from you? This is because there are some 3rd party entities that says or confirms this move of money, which is for example your bank or the card network (Visa, MasterCard or American Express). The café trusts this 3rd party entity. But what happens if your bank, or the card networks get hacked; or if their systems crashed completely? Blockchain is a system without those 3rd party entities. Essentially, the database is kept by many ledgers so it is very difficult to be hacked, or less likely that system crashes occur to all the ledgers. So, if for example you pay your coffee with Bitcoin (a type of Cryptocurrency), the Bitcoin is transferred peer-to-peer from your Bitcoin address to the cafe's Bitcoin address. And this transaction (Bitcoin movement) is listed in distributed ledgers, spread across the Bitcoin network. What if Andrew’s notebook got stolen? What if Andrew tries to steal money for himself? What if Andrew’s best friends try to manipulate him and the system to get more money? If we are to transform the classroom money bookkeeping system above to using a blockchain, the teacher will ask who in the classroom wants to take the job. Let’s say we have 7 people interested. These 7 people will then have to keep the same transactions records in their notebooks. This way, it will be more difficult to steal 7 different notebooks, or to manipulate 7 different people to steal money. But what are the benefits for these 7 people to work as the class accountants? Let’s say in this classroom, everybody loves chocolate, so we will use chocolates as the currency here. These 7 people will be rewarded (or competing to get) some chocolates for their bookkeeping job. In the blockchain and cryptocurrency world, we call these 7 people miners. They essentially are competing to calculate some complex mathematical equations. Whoever completed the calculations first, and have been confirmed by the sother people that his/her calculations are correct, will get the chocolate as the reward. This is why miners want to have the best system set up, with the most powerful machines. However, outside the 7 miners, these chocolates can also be traded (bought and sold) by other people in the classroom independently, because it has some sort of value (there is supply and demand for this currency in the classroom). And when the class becomes bigger and caters more students, we will have more demand for these chocolates, pushing the price up because the supply is kept low or only grow at a slower pace. In the real life of cryptocurrency, the chocolate used in the analogy here can be Bitcoin, Ether (the currency used in the Ethereum blockchain), or any other types of cryptocurrencies. If you compare this with a common national currency which is normally controlled by a central bank, no regular people like you and I would know how much money will be printed in the next 10 years; Or what the central bank interest rate will be next year. With cryptocurrencies, these are all visible inside the code. Cryptocurrencies are decentralized, in a sense that no one person or one entity can control them. The code does not sit in a central server somewhere, or operated by one company. But instead, the exact copies of the code are spread across the network. You can also choose to run a node yourself, where you share the blocks and transaction records of the blockchain in your machine. Knowing that cryptocurrencies are transparent and decentralized, we can then know exactly what’s the current supply and what’s the supply will be in the future. Anything in this world that you can buy and sell, has a price. And the price of everything is determined by none other than supply and demand. Imagine if every person in the world has apple trees that produce unlimited amount of apple – all with the same quality. Then the price of apple will be close to 0, as there is no point of buying or selling apples because everybody can have them for free. Here’s another analogy: Imagine if there are only ten special edition Ferraris in the world. You’ve decided to buy one for a high price, due to its exclusivity. However, 5 years down the line, Ferrari has decided to create 10,000 more of the same car. How would you feel? And what do you think is going to happen to the price? It has exactly the same concept as shares / stocks. To understand the value of a company, you would need to know their market capitalization, which you can get from the number of shares available and its share price. Understanding their future earnings and profit margins will be helpful as well, but that's a different subject. 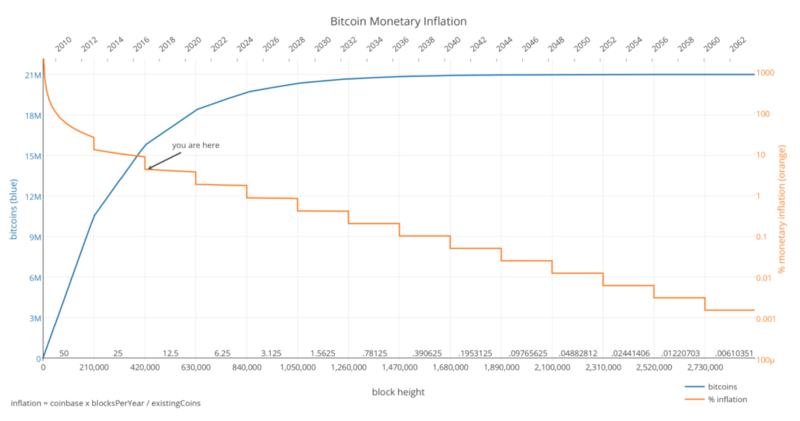 Let’s look at Bitcoin supply and inflation rate for our example here. The chart below is based on the code of Bitcoin, and it can tell you exactly how much Bitcoin will be in circulation in any time period in the future. Whatever has occurred and confirmed on the blockchain, cannot be undone. So if you have made an incorrect transaction by sending your funds to an incorrect address, your money is basically gone - unless if the owner of that address is kind enough to return your money. But then again, it is almost impossible to investigate which person on earth owns an address in question. There are of course cases in the blockchain space where the opposite occurs, and it would be a big news. For example, there has been an incident in the Ethereum space: The DAO hack - where a hacker stole a large amount of Ether (~15%) in circulation. The founders and developers of Ethereum refused to allow this to happen, so they created a fork (a new branch / version of Ethereum) where this version does not acknowledge the hack has happened. The old version of Ethereum however, still exist and also known as Ethereum Classic. A good and strong blockchain would be supported by a large number of miners who are securing the network with their computing power. Mining is a large business on its own. 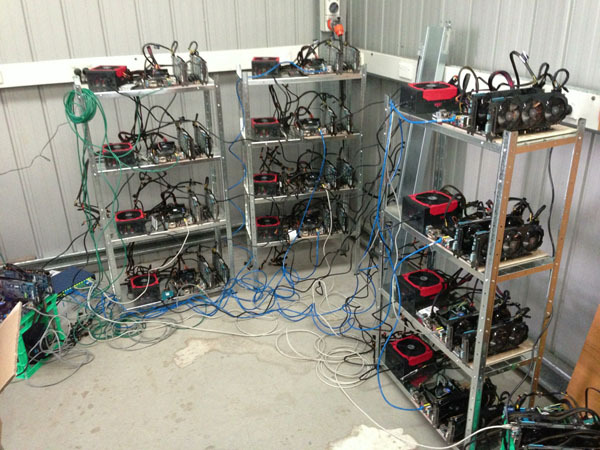 Miners are rewarded by the cryptocurrencies they mine. Essentially, these miners are competing to solve mathematical equations. Whoever solves them first and creates a new block in the blockchain, gets rewarded. Therefore these miners are willing to invest a lot of money to secure large computing power and pay for their electricity bills. Note that the above explanation about mining, applies to proof-of-work blockchains, like Bitcoin. Some types of blockchain (for example the future of Ethereum, will use proof-of-stake system - or virtual mining). This is a whole subject on its own. To be able to hack a blockchain, you would need to control more than 50% computing power that secures the network (known as 51% attack). You probably have heard about some blockchain hacks in the past? These hacks are mostly occured to exchanges (Mt. Gox for example) and also smart contracts that have vulnerable security bugs (e.g. The DAO), and not hack to the blockchain itself.